This Focal Geographic area extends from the northeast tip of New Jersey all the way down the Atlantic Coast to the tip of the Florida Keys, then up the Gulf Coast of Florida to the border with Alabama. This region is a human-dominated coastal landscape, but there are critical year-round habitats for shorebirds. The most important habitats are the outer coastal strand of beaches, inlets, tidal flats, and saltmarsh. 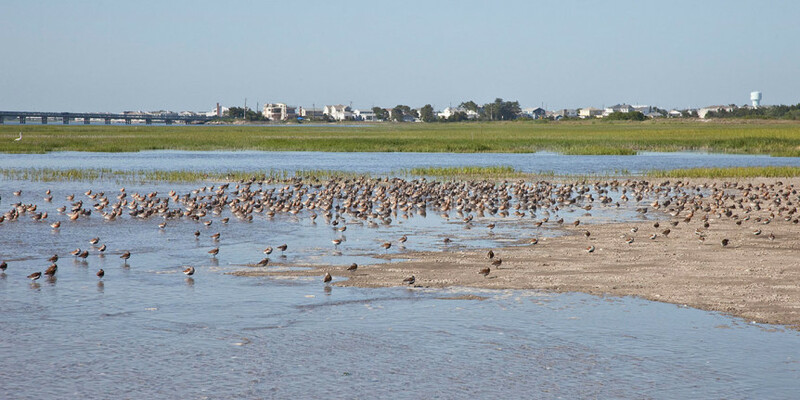 Providing and maintaining quality nesting, migration stopover, and wintering sites in the southeastern U.S. is extremely important for population health and stability of Atlantic Flyway shorebird populations. The Focal Geographic area includes the important spring staging sites of Delaware Bay, and large areas of undeveloped barrier islands and saltmarshes from Virginia to Georgia. All states in the region are important to shorebirds. Threats in this region are similar to the Northeast, but the need for protective management in coastal barrier habitats, especially in the most southern states where the season for recreation is extended to include the entire year. Noteworthy threats for the area include incompatible coastal engineering; commercial, industrial, and residential development; human disturbance; pollution; predation of eggs, chicks, and adults from elevated numbers of native, non-native, and domestic predators; incompatible management practices (i.e. sea turtle conservation patrols and others); and, invasive exotic marine invertebrates that threaten access to and availability of intertidal food resources.